Hello All I’m launching a photo challenge over on Twitter and Instagram in February for Black History Month. I urge you all to take part and add to the challenge, the more the merrier. Primarily, there will be photos of books but you can add photos of movies and other things if you prefer. It’s going to be a chance to get more recommendations to lengthen your TBRs and spark conversation about our favorite books. 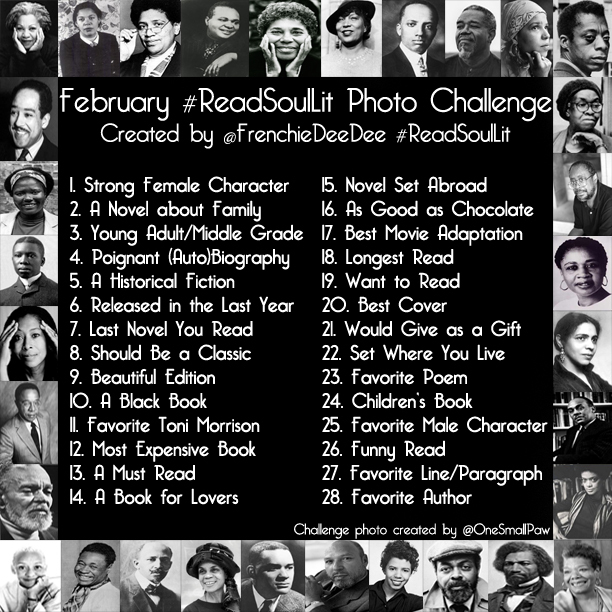 #ReadSoulLit is the tag you should use and please share it and the challenge photo everywhere, which has already started circulating over on Twitter and Instagram. My handle on Twitter is Frenchiedee@ReadEngDee and on Instagram I’m FrenchieDeeDee. I’m linking the photo challenge below so that you can start getting your books and photos lined up to join in the fun. I’ll also be linking videos from fellow Booktubers, as well as my own (channel name: frenchiedee) on a variety of themes for Black History Month. Of course there will be my usual reviews too. Looking forward to chatting with you on here and over there. So, what are you planning to read for Black History Month? Didi – I’m not on Twitter, Instagram or YouTube but his looks like a great challenge—I love the list of 28 items. Ahh! That’s too bad. No worries because I’ll be putting some of the videos up on my blog so you can watch them there. As for Instagram you can look at things without having a page. Just type in Instagram.com or click on the link in my post. Are you going to be reading anything special next month? I’m not much on Twitter or Instagram, but inspired by your YouTube video and in honor of Black History Month I have the first Aya book waiting for me at the library. I also have Dust Tracks on the Road by Zora Neale Hurston. Aya is pretty good. Dust Tracks has been on my TBR of at least a year. I’m sure it’s very good. Happy reading Jenny! I will definitely be participating!!!! Hey sis…can you explain what #10 is/means? Is that a book with a ‘black’ cover? black comedy? a book disliked by the reader? Hi Phyllis it’s a Black cover. Hi Didi. This is the first time that I comment here. – I could be seen last summer at the Reina Sofía Museum in Spain an art exhibition by Kerry James Marshall. I loved the paintings and his drawings (which are entitled “Dailis”). I recommend you to see his work and watch the interview. – My current reading is “Sula” by T. Morrison. Previous Previous post: A Special Wednesday….